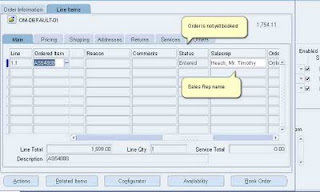 This blog about the functionality of Processing Constraint available in Oracle Order Management and how to do Setup for PC. 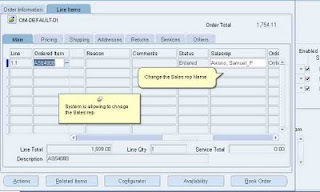 Processing Constraints –Processing constraints is a common security framework in Order Management where you can define and build security rules around sales entities (Line, header , line payments etc). 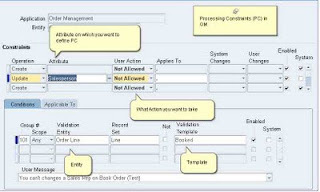 Using processing constraints in Order Management you can define the conditions and status at which an update can be made to an entity. For example a line cannot be cancelled after it has been shipped. This can be seeded as a system constraint to prevent data corruptions. Similarly you can define constraints that suit your business practices and prevent changes. These constraints can be defined at the entity level and for each attribute. 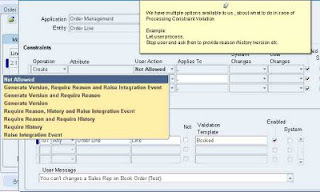 When you attempt to make changes to an order, Order Management validates the changes against processing constraints enabled. 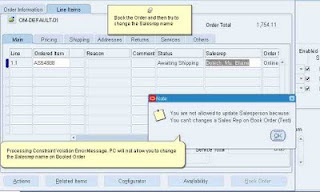 In addition, Order Management validates the order changes based on your user responsibility. 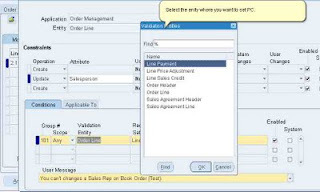 In My example, I will define a processing constraint where salesrep can be change as ling as order is not booked, but once order is booked system should not allow user to change the Processing Constraints. Step # 1 - Select the Attribute for which you want to define the PC. 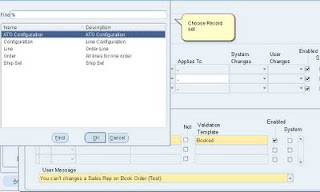 For example: If multiple constraints are setup for Price List and operation = UPDATE so conditions for both versioning and audit constraint apply, only versioning will be captured. Step # 3 - Select the Entity for which you want to define PC. 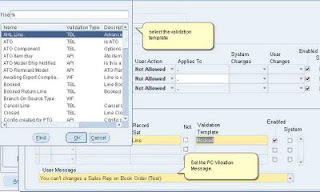 Step # 5- Select the Validation Template , you can define your own Validation template. 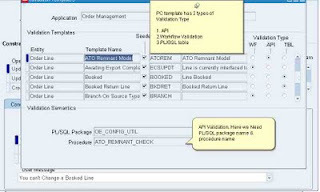 1.Template based on API – here we can use and pl/sql procedure for validations. 3.Template based on Table - As shown below. 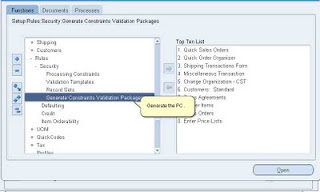 Once you define the validations, generate the constraints. 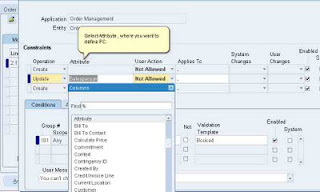 Check the screen # 2 to see how to define custom message for a Processing Constraint. Thanks for the wonderful illustration of the Processing Constraint in OM. It was very helpful. 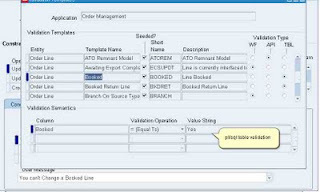 I have a query - can i add Validation Operator (contains, like ) in Validation Template.